This entry was posted in Questioning Quest and tagged curiosity, natural curiosity, Questioning Quest, Science, science experiments by stevemouldey. Bookmark the permalink. Is it that science is not taught well or at all? Is it too hands off? Is it book related or copy notes from board? Is there a perception that it’s for boys? For me it was senior secondary Science where I spent hours copying notes and “experiments” were more a task of copying the hypothesis and method out into our books before doing something we already knew the outcome to. I know that has shifted a long way in many schools but in all schools? I think that there are many reasons, one is that we don’t have any prominent female role models in the STEM field that our children are exposed to in the media. We have pop stars, movie actors, but no smart females that our girls can say “I want to be like that” about. We also don’t have a system where children get to have a public voice. I was so touched by the intelligence and curiosity of the children yesterday. They all wanted to share their knowledge with me and show me how much they knew, yet I am not sure how often they get to do this in a space that isn’t at home or at school. Building self confidence by allowing our children to have a voice that is heard is crucial to fighting off self-esteem issues, especially with our girls. One thing I hear from children a lot is “I never knew science could be so much fun”. Sadly with the strict curriculum we have to follow, and success being measured in the grade the child receives rather than the experience they have, we are pushing our kids to achieving numbers as outputs rather than nurturing our kids to be inquisitive. 1. Where are the female scientists? I love that I can use your TEDx talk and refer to what you say on the Paul Henry Show etc. I just don’t see other scientists (particularly female) being so accessible and openly in-tune with the “in” scietisfic topics. Mark Quigley made geology “cool”, Chris Hatfield brought astronomy back to the masses. But where are the other females…? BBC does have some great female role models, but they are presenters, not accessible. Michelle, you are a “science rock star” to my students (and to me) – thank you. 2. Our insistence on grading everything! The NZ Curriculum is actually not overly strict or prescriptive. The externally-assessed component of NCEA is, however. This creates pressure in junior courses to cover content. I do have to ponder: how much of this content do students REALLY retain year after year, unless it is put into a meaningful context…? This leads to parents expecting their children to be taught lots of content, usually at the expense of the Nature (and wonder) of Science. Your number 2 point here is one that we have been discussing rigorously here of late. I am hoping to see a hack and slash of heavy ‘content’ teaching in junior science in favour of proper nature of science investigation and inquiry. I’m of the opinion that what is assessed in a year should be taught in that yet, and that Year 10 should not be used as vehicle for pre-teaching L1 Science content to make it ‘easier’ for them the following year. And yes, being in an all girls school, Nano-girl is a rock start here too! We do lots of in-house Women in Science promotion and have a high % of school leavers move in to Science fields at tertiary. Michelle is doing an amazing job at being accessible and making science cool. However, re your comment about other scientists, I actually think there’s a lack of opportunities for scientists to be able to be this accessible- be they male or female, but probably especially female. How many spaces can there be in New Zealand for scientists to have a prominent face on media? Very few in reality. Mark Quigley for example seized an opportunity or was thrust into the spotlight because of the earthquakes. But such dramatic opportunities don’t readily eventuate, meaning a very small pool of scientists are selected as the face of science on TV/radio. On top of that a lot probably comes down to institutional support- I do masses of science communication for example but nearly always at my own initiative and I don’t think I would receive the type of support to do anything further than I do. There are probably lots of scientists who would happily step up like myself, but without support, much time and being typically paid nothing for this extra burden it becomes a bit of an impossible dream. Michelle makes some excellent and very true comments about curriculum, public voice and role models above. I think the trap we often fall into with secondary school Science is that we teach units that are heavy in content and new skills. There is a new set of vocabulary, making it feel like a foreign language. Science is HARD! It is such a shame that we do this to our students. I spend all of Term One making my Year 9 students understand (and believe) that are are already scientists in what they do every day. I make them understand that they already use the Scientific Method all the time, using THEIR contexts. Where this all falls down is when we make students write up lab reports, and when we use external assessments to measure student success in Science. Lab reports are boring to write…so why not let them make a presentation instead? We can work on the formal scientific lab report as a “next step”. Covering content early enough so it isn’t new and overwhelming in the NCEA years is another issue altogether. I am unsure students retain much detail from year to year, so think we need to spend more time on thinking like a scientist and being exposed to the awe of Science, but understand the resistance to “diluting” the content focus. I would argue that, in Junior Science, it would be better to focus on meaningful (and fun!!) investigations and the reporting of their outcomes, and know that some content will not be covered until the NCEA years, but that the students will have the scientific method/inquiry process better-established so will be better-prepared to “fill the gaps”. Love these thoughts Matt. Am a frustrated outsider at times seeing so much content covered when the only compulsory part of NZC Science is the Nature of Science. Surely this enables teachers to negotiate learning paths with students based on their passions and the skills and base knowledge you know they will need in the senior school? I would echo a lot of what Matt Says – We need to help kids learn to think scientifically, not just recall the thinking that has been done by others in the past. I also agree with Michelle; role models are sorely lacking – I think we have a similar problem as the “sweaty geek” images people sometimes have of people in computer science…? I’ve spent the last 12 months working in science education from early years all the way through to secondary. This has been insightful on a number of levels both in terms of my research in preparation for this work and my experiences while at the chalk face (although we don’t even have white boards, never mind chalk 😉 ). The most often cited examples of effective pedagogical approaches such as CASE (Cognitive Acceleration Through Science Education) focus on developing thinking and also relate the complexity of thinking that kids engage in with their level of cognitive development (Piagiet Stylee). However, most examples I have seen of this in a classroom has involved the boring experiments included in the original book created in the mid 90′s. I know I’ve spent a lot of the last year trying to craft ways that we can leverage this focus on thinking while kids are working with contexts they’re interested in. However, I really think we need to be careful with this idea of science being fun. Of course it is and it should be, but there are a number of reasons science can be fun and not all of them are the ones we may wish to nurture. 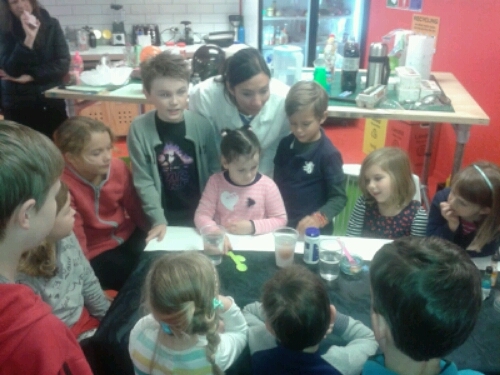 I often hear of kids in primary schools getting kids involved with the old baking soda and vinegar volcano or other “cool” demonstrations and I worry that these promote a passive appraoch to science where kids sit back, watch the demo and enjoy the bubbles, pops, bangs and bright colours. On another level science is fun because it is puzzling, it is awe inspiringly immense, and because it is hard and sometimes we just can’t figure it out. This mystery is what keeps all of us searching for the answers to the big questions. In my opinion the big challenge for all science educators is do our best to strike a balance between the many contraints in play. The main ones on my mind are ensuring that the lessons focusssed on enquiry involve tasks where the conclusion is unknown OR where there are more than one answer / or solution to identify. This allows kids to get a sense of what it is like to be a scientist (where no answer can be found in the back of a book or on google). The maker appraoch to science enquiry is great with this in mind. I think I remember Matt telling me about a magic show his senior chemists were creating – this is a great example as they had to study the reactions and learn to predict the exact timings of reactions so they could make them look magical. This is science inquiry with a design brief that keeps it all relevant. I also think we need to be careful not to ignore the value of awesome science story tellers . These guys can found in schools, on TV and in the wider scientific community (such as Michelle). I often think we are now so concerned to be student centred, that we avoid lessons where someone is talking to a class for a prolounged period. My own experience as a teacher and a learner tells me that these experiences can be awesome. Knowing which are most interesting and which kids will care is perhaps the challenge? Thanks for this post Steve. I’ve said it before but your blogging is awesome! Thought provoking, honest and genuine. Hope to catch up soon buddy! I had really good female secondary science teachers and really bad ones. Both I still remember. But the biggest influence for me was my Dad who is a science teacher but who spent time with me instilling a sense of curiosity in the world around me – I spent ages in his shed pulling apart old electronics just to see what was in them, digging around in the garden looking at insects, mixing things in my mums kitchen. 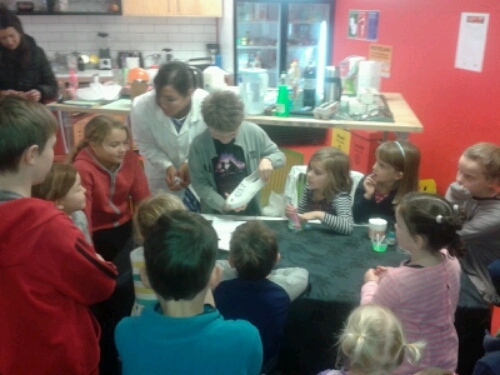 We ran a science evening at school (Primary) and I was astounded by the amazement of the parents at the experiments we ran – and they were just the fun ones they could do at home – food colouring in milk, floating eggs, broken toothpicks. They were like kids themselves with the enjoyment they got from the activities. We also modelled to them how they could then encourage their kids to question and take their thinking to the next step. I think one area we need to work on to help with children’s engagement is the parents engagement and knowledge of what they can do at home to create that sense of wonder and joy at exploring the world. The fact that they don’t ned to know all the answers, that they just need to let their kids explore and ask questions. Awesome question – and great comments! Teaching in a girls school, I find it fun and challenging to try and make Science exciting and as much fun as it could be in the junior school. Where I find it gets hard is in the senior levels. Where the content required for NCEA levels One, Two and Three are massive and trying to incorporate NoS gets put to the sideline. Inviting back ex students who have finished tertiary science qualifications and are working in a science-y related field is a great way to provide strong female role models for our students. We also have a Science Week, run by our senior students, where they organise quizes, experiment days, science documentaries and invite Scientists from our community to talk also seems to engage students, and hopefully make them interested in Science more in the classroom. Thanks for drawing our attention to this one Steve! My daughter was one of the older quiet ones at the event on Sunday. I found it really interesting and concerning that as more kids arrived to take part in the activities, the younger kids were chatty and asking questions and were really engaged. The older boys also were talking and interacting. 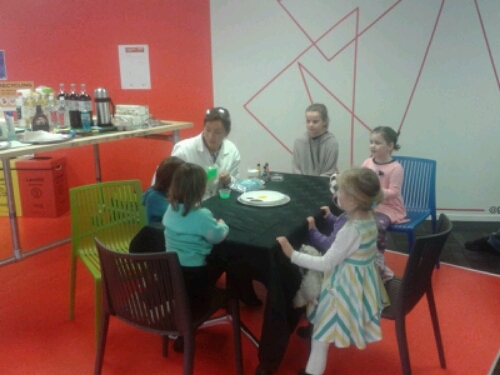 The older girls were really quiet, still engaged, but not talking. There almost seemed to be an age limit to the talk and interaction from the girls. This is no way a criticism of the activities because they were really fun and interactive and Nanogirl was questioning and encouraging all the children to join in. Nanogirl also makes a good point about girls needing scientific role models and she is a brilliant role model. I think I now have more questions and few answers. I am not sure if single gender science lessons are the answer either, but as a Mum of a smart, curious 11 year old girl who loves science but lacked confidence to contribute in that busy group at the weekend, I would love to find the answer.